In the aftermath of Trump’s election, there was nothing worrying about seeing the already infamous pro-establishment mainstream media propping up the Cambridge Analytica  narrative, which attributed his victory to his campaign’s use of the predictive models developed by the firm, which was also credited with having helped Brexit to succeed. This line was advanced in order to blame their own failure on such mythical (or at least mythically represented) beings as “meta-data” or “micro-targeting” – making it out to be like some kind of Harry Potter story, which was much more convenient than admitting that many Trump voters made their choice not in spite of the gigantic media bias toward Hillary, but because of the bias. 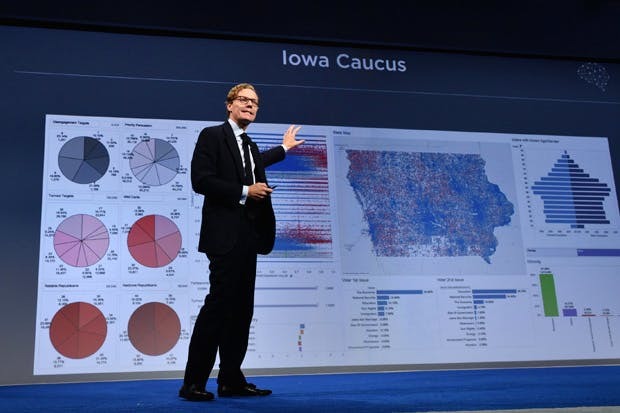 From their schizophrenic, often moronic point of view, the Big Data narrative was, after all, little more than a less paranoid version of the Russian hacking fairy tale. But there’s a basic fact about Trump which quality hair-dying and attractive trophy wives tend to consign to oblivion, and which I was reminded of by a recent (and otherwise, not totally convincing and all too psychological) piece  in The Duran: Trump is seventy. He never writes e-mails, only recently bought his first smartphone, and, though he’s been on Twitter for at least four years, he keeps using it with the rabid zeal of newcomers to the digital dimension. This in itself, of course, means next to nothing. History and literature are full of chaste yet very skilled brothel keepers, and of teetotallers running hugely profitable bootlegging operations. But what if? What if Trump, even though he clearly understood that his surprise victory was the American equivalent of Brexit, in spite of Bannon’s advice, in spite of all the frenzied tweeting – what if Trump, because of his age, really doesn’t get it? What if he underestimates the Gutenberg-like paradigm shift underlying his victory? What if Trump believes that he owes more to the Cambridge Analytica skulduggery than to Alex Jones, Ramsey Paul, Milo, ZeroHedge, and so on put together? Americans tend to divinize technology and ignore cultural dynamics. The transition from the late (audio-visual) Gutenberg galaxy to the era of bilateral, zero-cost, online information is probably not that impressive to them, as it entails no radically new hard tech (neither did the Gutenberg press, by the way . . .), while the complicated mathematics of psychometric campaigning, well-marketed with the rhetorical spice of “Big Data” (as if big data is essentially more than a lot of small data put together), is a good candidate for the pantheon of worshippers of technique. In other terms: what if Trump actually is a charlatan who happened to often speak the truth, and knew that it is the truth, but did not actually believe that a majority of the voters would be able to recognize it as such? This would explain, with no added conspiracy theory, the apparent frivolity of his recent Syria U-turn. In that case, you don’t even have to make him out to be a complete idiot for buying the story about Syrian children being murdered by Assad’s forces. Supposing that he does not value his (underestimated) Alt Right, online freedom-fighter constituency more than his neo-con/hawkish supporters, sacrificing the former to satisfy the latter makes perfect sense, since the latter also includes powerful business spheres, the support of which he will badly need to realize his domestic economic policies. If this hypothesis is right, then the mid-term elections will probably help to sober the God Emperor up out of this Cambridge Ethylica. By then, anyway, he will probably have noticed that there is no good compromise with the hawks: once you start caving in to their blackmail, they just keep asking for more, and more, and more. So there might indeed be further Trump surprises ahead, though not necessarily premeditated ones. Let us just hope that none of those surprises includes a nuclear war.